These Texas-Style sheet pan nachos are the perfect recipe to add to your game day spread. 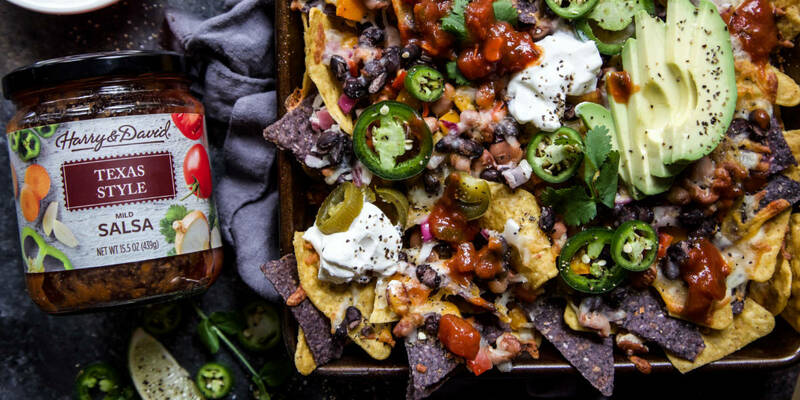 Created by Lauren from Climbing Grier Mountain, Harry & David Texas-Style Salsa makes the perfect topping for these vegetarian nachos. With plenty of cheese and fun toppings, these nachos are sure to score with your guests on game day! Are you ready for the game day dance? In my opinion, game day is all about the spread! I’m talking little smokies, barbecue pork sliders, endless amounts of wings, charcuterie, bowls of chili, and nachos! One could live off these sheet pan nachos. Is that even a dare? Today I want to share with you an easy recipe that you can whip up for game day that takes just minutes to make. 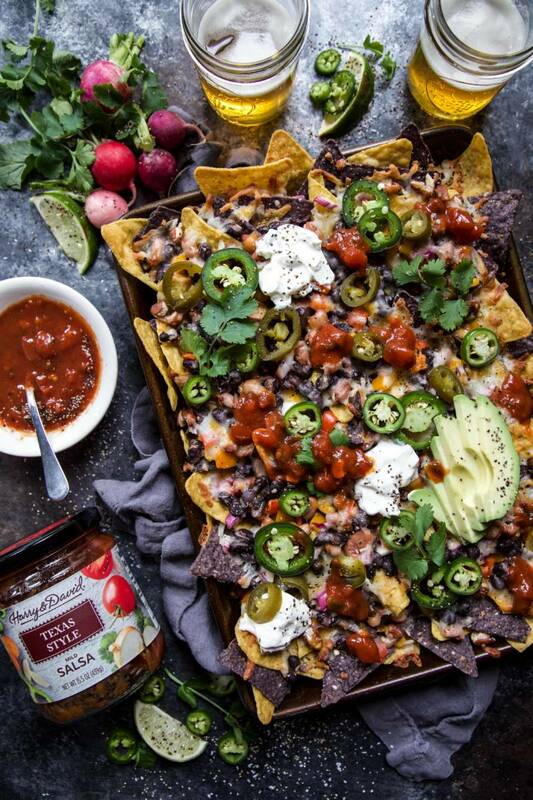 Meet your new best friend, Sheet Pan Nachos with Texas-Style Salsa. What I love most about making nachos is the versatility. 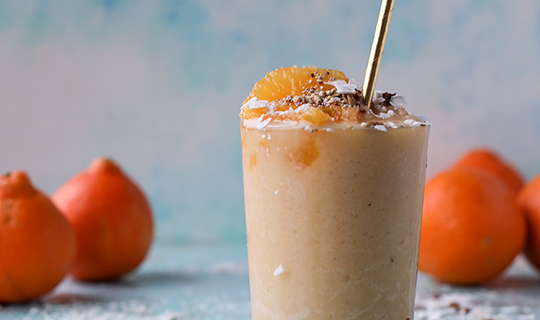 You can add whatever ingredients your heart desires. For this version I went vegetarian by adding peppers, onions, and a mixture of beans. And, of course, cheese and more cheese. But when it comes down to it, the most important feature of any nacho presentation is the garnishes. The usual suspects should always make an appearance – sour cream, avocado, cilantro, and jalapeños. But really, it’s all about the salsa. 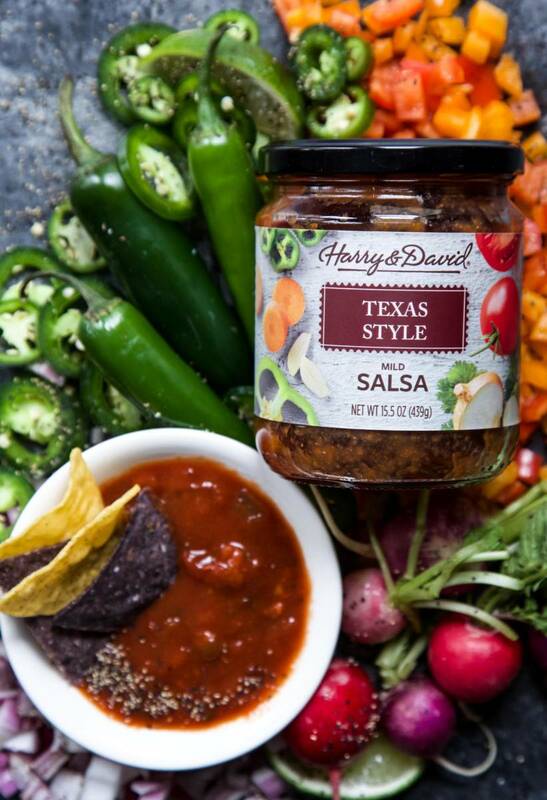 Harry and David Texas-Style Salsa is always going to make your nachos an 11/10 situation. Made with tomatoes, onions, carrots, and bell peppers. Then spiced with salt, garlic, and cilantro. This salsa is rich, savory and full of flavor! So, who’s ready for the big game now? Preheat your oven to 325 degrees. Spray a 1/4-sheet pan with non-stick cooking spray. Take the corn and blue corn tortilla chips and arrange them in a colorful display on the baking sheet in a single layer. Next, top the tortillas chips with red pepper, orange pepper, red onion, black beans, and pinto beans making sure all the ingredients are spread out evenly. In a medium bowl, mix together Monterey Jack, mozzarella and pepper jack. Sprinkle the cheese on top of the veggie and beans. Place the sheet pan into the oven and bake until golden brown or until the cheese has melted. Remove the sheet pan from the oven and garnish with Harry & David Texas Style Salsa, avocado, sour cream, pickled jalapeños, fresh jalapeños, and cilantro. Serve and enjoy!